The Best Ingredients For The Best Results. 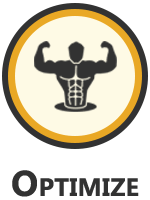 GSH Gold was formulated to change the way the world thinks about one-a-day supplements. Using powerful ingredients in robust amounts, GSH Gold is formulated to noticeably improve your health and well-being. Glutathione is considered the body’s master antioxidant, capable of detoxifying our cells, chelating heavy metals and improving immune function. Supplementing glutathione levels with a top quality L-glutathione complex is considered one of the best ways to improve overall health and wellbeing. Repairing and maintaining of our cells are two of the most important tasks glutathione performs in our body. The benefits of total cellular health reach across the body’s systems, improving energy production and aiding in the prevention of a myriad of health conditions. GSH Gold was formulated to significantly boost glutathione levels through three distinct methods. Offering a direct source of glutathione with top quality L-glutathione, improving the body’s natural production of glutathione with powerful precursors, and lastly by enhancing the methylation cycle in order to recycle oxidized glutathione. Effectively raising glutathione levels with a carefully formulated antioxidant complex will enhance your life! GSH Gold is formulated to improve glutathione levels, the best way to improve glutathione levels is directly with L-glutathione. Proven to significantly enhance the body’s stores of glutathione, L-glutathione is the single most important antioxidant that we can easily supplement. Enhancing glutathione levels with a top quality L-glutathione complex yields profound health benefits. Helping to improve immune function, cellular repair and energy production through the detoxification and chelation of toxic compounds that accumulate in the body. Our body naturally produces this mother of antioxidants, however virtually everyone is deficient due to a number of environmental factors as well as age. 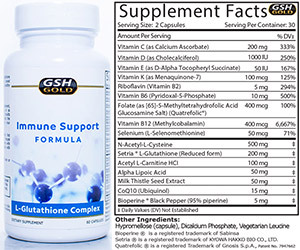 Making it vital to supplement GSH levels with a top quality supplement in order to achieve and maintain optimal health. One of the premier glutathione precursors, capable of revving up the bodys natural GSH production process. 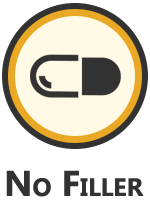 N acetylcysteine offers a host of health benefits along with its ability to significantly improve glutathione synthesis. NAC has the ability to inhibit virus reproduction and lifespan, effectively minimizing symptoms and longevity of the influenza virus. Referred to as the ultimate preventative and cure for the flu, something that everyone can benefit from during cold and flu season. It is also a powerful antimucolytic, which helps eliminate the mucus buildup responsible for laboured breathing and coughing. Functioning as a powerful antioxidant which promotes glutathione production, Acetyl L-Carnitine is the more bioavailable form of L-Carnitine. Involved in cellular metabolism, Acetyl L-Carnitine helps to increase energy production in the mitochondria. This increase in cellular energy production helps boost both our physical and mental stamina. Used to help improve memory, ward off neurodegenerative disease, prevent depression, improve cardiovascular function and improve athletic performance and recovery. The primary dietary source of L-Carnitine is red meat, leaving vegetarians and vegans particularly vulnerable to deficiency. Essential for countless cellular processes in the body, folate is vital to our methylation cycle which helps to activate and recycle some of the most powerful antioxidants in our body. Much of the food we eat is fortified with folic acid, a form of folate which can be harmful to individuals with a genetic mutation known as MTHFR. Incapable of processing folic acid properly leaves these individuals at risk of developing a folate deficiency which reaps havoc on the body. Depleting our antioxidant stores and crippling immune function. 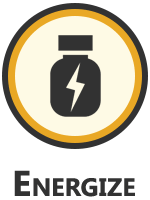 Supplementing folate in a bioavailable form such as L-methylfolate or 5-methyltetrahydrofolate is the most effective way to combat this deficiency and improve the methylation process. Quatrefolic® is the premier folate supplement which offers maximum bioavailability and immune health benefits. Disclosure: We are affiliated with GSH Gold. In fact, GlutathionePRO was consulted during the formulation of this product. We endorse GSH Gold and stand behind it 100%.